Marathon Taper and Bonus Race Pics! I am still here, just busy and wrapping up the LAST 2 WEEKS OF MARATHON TRAINING!! Yes, that's right, Colorado is now just over a week away and I am SO ridiculously excited!! I feel totally ready and just am trying to cruise through these last workouts and get there healthy and strong. Life has been busy, as usual, with a couple of extra fun life challenges thrown in for good measure (you know, little things like getting the house ready and on the market for a potential impending summer move, yada, yada, yada--stay tuned for the saga that is sure to ensue on that). So while I have had some nice runs lately, they are kind of a blur with everything else going on in my life. I can't think of anything meaningful to say about them, save the fact that they have been good and I got to do one of them with my awesomely adorably prego gal Niki of Cross Country Squared who was Denver-bound for a few days, and another on my old turf back in Nebraska. Also the HRCA Cinco de Mayo 5k is this Saturday which I am excited to run...as you may or may not recall (did I actually have anyone reading back then? 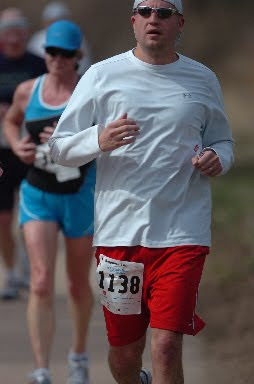 ), last year I did the 10k Cinco race. Well, this year they replaced the 10K with a duathlon, and since I don't bike or cycle or anything else on two wheels that involves extra equipment and cost, I am opting to do the 5k. Surely the weather will be better than the St. Pats 5k was, so we'll see what I can turn out. Of course, there were NO offical race pics of moi, but here is a dandy of the hubs. That tiny little fleck of skin to the left of his elbow is probably some component of my body, since we ran the whole race together. Wow, what a spectacularly perfect day for racing! The weather was heavenly and nearly the entire race course runs along the Platte River trail with it's gurgling water, grassy banks, shady trees (as you get into Denver; not to be confused with Shady Figures, see following sentence)...and goose poop. Now, the view on the other side of the trail is typically pretty disgust (industrial buildings, Waste Management dump and the like) but as long as you only look to the River side, it is beautiful. Keep that in mind if you run this race. Now for the race/organization assessment: plenty of parking, well organized, started on time, easy to navigate, porta potty attendants to keep the lines moving, fast-moving post-race food lines, plenty of post-race seating, good water/gatorade/gu stops, a free RTD light rail ticket back to my car at the race start. Can't ask for much more than that. Oh wait, yes I can: good shirts. Well, PR1/2 delivered with a decent-looking white LS tech tee that I won't be embarrassed to wear (Highlands Ranch, take note). This race is a SCORE in my opinion. A great value for the money, and very convenient. It was a good sized crowd (2,000-ish runners) but not so large as to be unmanageable. I give this race an all-around Thumbs Up. If you need more specific metrics, it would probably get an A in my book. Unfortunately, despite the organizers best attempt to persuade me otherwise with their little PR1/2 logo, this race was not a PR for me. I did go into it as a training run on my marathon plan, but also naturally thought I could probably best my 2:07:08 from last years Colfax 1/2. So, I went into it with a good plan for an easy PR. So, the moral of this race story for me was to learn that I cannot use the same fuel strategy when I race as when I do a LSD at 10:30 pace. I need fuel sooner to keep the fast pace going and not feel tired. Should have Gu-ed at mile 5 and again at 9 or 10. I think I would have been able to stay 9:30 and below had I done that. But I did learn that 9:50-10:00 is probably an achievable marathon pace for Colorado, as long as I fuel properly. So all-in-all it was a great race and a great MP training run! First, I thank you for taking the 10 minutes out of your presumably otherwise interesting and busy day in order to read my humble little occasional musings about my running life. That combined 30-50 minutes is a real sign of your dedication to the sport, as well as your unerring dedication to avoiding answering emails, playing with your children, sleeping, or otherwise occupying your time with something actually worthy of your time. You are a small but mighty audience, and one I will continue to imagine in my head, regardless of whether you are actually out there reading or not. Why? Because this blog is cathartic to me personally, and, well, I do tend toward selfishness. Platitudes out of the way, I would like to request one small favor: though you may speak another language as your mother tongue, if you do not actually read what I am writing or are not able to comment in English, please refrain from commenting. Don't worry, I will still imagine you reading anyway; I just don't want to have to make the effort to remove your incoherent comments from my pages. See, told you: S-E-L-F-I-S-H.
P.S. - It's going to be a weekend of beautiful weather in Denver, and there is nothing I am looking forward to more than the Platte River Half Marathon on Sunday morning. Well, except the giant nap I am going to take on Sunday afternoon, after I SHATTER my 1/2 marathon PR, and with a belly full of post-race meal free meat (oh, the double entendre is just CRYING for attention right now). Platte River Half Marathon this weekend! One more 20-miler to go and then taper! Lovely spring weather and I GET to run!!! 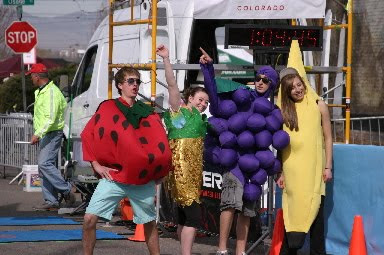 Official planning for 2010 Wild West Relay and Colorado Relay teams has commenced!!! Running without iPod = oddly, I'm loving it...it's meditative, yo (maybe not like Trancendental Shambahla-esque, but meditative nonetheless)! This reminded me of Nitmos and Vanilla!